...one of the most subversive and intoxicating films of the late 1960s: a headlong dive into a dazzling, unseen Tokyo night-world of drag queen bars and fabulous divas, fueled by booze, drugs, fuzz guitars, performance art and black mascara. No less than Stanley Kubrick cited the film as a direct influence on his own dystopian classic A Clockwork Orange. It's finally set to come out on Blu-ray in the U.S. in November. Cinelicious are the same folks who gave us the magnificent 4K restoration of Belladonna Of Sadness. We at Ganriki have been waiting for this one for literally years, so it can't come to us soon enough. 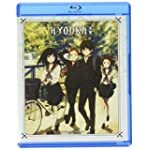 Detective/slice-of-life anime Hyouka garnered something of a cult following, and from the look of it a wholly deserved one, in part due to it long being unavailable (for no discernible reason) in a domestic release. Absence makes the curiosity grow fonder. Now a live-action version has been completed — although from the trailer available, it looks like one of the most key elements of the original is missing: the spellbinding, quasi-psychedelic visuals used to enhance the story. But it looks like they're being pretty faithful to the plot, at least.